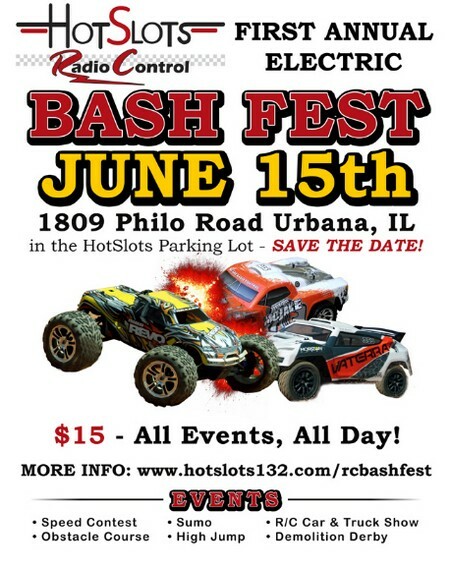 Event – HotSlots Bash Fest, Urbana IL, June 15th « Big Squid RC – RC Car and Truck News, Reviews, Videos, and More! Have you been looking for a Bash Event to hit this summer? Here in the midwest there is a hobby shop called HotSlots in the mecca of rc, Urbana Illinois. 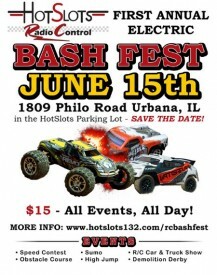 HotSlots is holding their very first bash next weekend, Saturday June 15th from 10am until 3pm. Events include high jump, top speed, sumo wrestling, obstacle course, and of course the very popular demolition derby. There is a $15 flat entry fee that goes to the Urbana Middle School Lego Robotics Club. The BigSquidRC Bash Crew will be there covering the event, hopefully we’ll see you there. For complete information, just Click Here, or you can call 217-607-1837. What does rc sumo wresting look like? Click HERE to find out.